Duct Cleaningis essentialFor your family's health. Have Total Comfort clean your Air Ducts Today! Did you that studies show that indoor air acually contains more irritants that the air outside? This is a disturbing fact because most individuals spend the majority of their time inside homes. The problem of indoor air pollution can be linked directly to contaminated heating and/or cooling system components of forced air systems. By investing in our duct cleaning services for your home in Palm Coast, your family will breathe easier knowing that all the components of your forced air system have been cleaned, improving the air quality within your home. Duct cleaning uses specialized tools to dislodge and remove dirt and other debris in air delivery systems followed by a thorough sanitizing process. This includes the cleansing of various system components of forced air systems. The supply and return air ducts and registers, grilles, diffusers, blowers, and cooling coils. A whole-house duct cleaning will kill germs and bacteria, improve comfort system efficiency, make your home smell cleaner and is recommended by many doctors and allergists. When Should Ducts be Cleaned? Unlike by-yearly maintenance of your comfort system, you don't have to have your ducts cleaned at specific intervals. Rather, you should clean them whenever they get dirty and full of air polluting debris. when four odors begin to fill your home, dusting becomes a never ending task or your family suddenly develops allergies or breathing problems with your home, consider duct cleaning. Simple, Total Comfort technicians are NADCA certified as knowledgeable, trained duct cleaning experts; and, Total comfort guarantees to clean ALL of your duct system, not just part of it. From their office staff to their outside work staff, we are 100% impressed. That's saying a lot since my husband and I were in the home/office construction and lumber business for almost 35 years prior to retiring to Palm Coast. Thank you for your terrific lead for a great, local electrician. 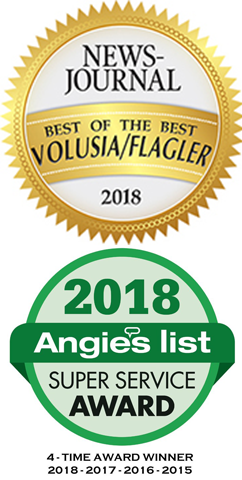 Serving Volusia County and Flagler County including; Palm Coast, Daytona Beach, Daytona Beach Shores, South Daytona, Deland, Holly Hill, Deltona, New Smyrna Beach, Port Orange, Ponce Inlet, Edgewater, Palm Coast, Flagler Beach, Bunnell. We provide certified heat and air technicians for heat and air conditioning, qualified electricians for your electrical work, skilled plumbers for your all of your plumbing needs and specialists in lp (liquid petroleum)/propane gas.